Earlier this week, in the evening when the sun is slanted and seems to be infused in gold, I was in my studio sewing and looked across to my worktable and supply shelf. A perfect infusion of light and warmth into the place I create, the place where I feel most at home. The evening light cast shadows and created highlights. And my studio was filled with a color I could never recreate. So simple. Such a simple, beautiful, peaceful moment in a day in which I had changed gears many times. It was a gift. Sunlight through a window is a favorite subject matter of artists for easy-to-understand reasons. The light transforms everyday objects. And it connotes warmth and healing. And artists, whose nature is to see things other people do not easily see, and to show those things through the creation of work, are given a gift of subject matter. 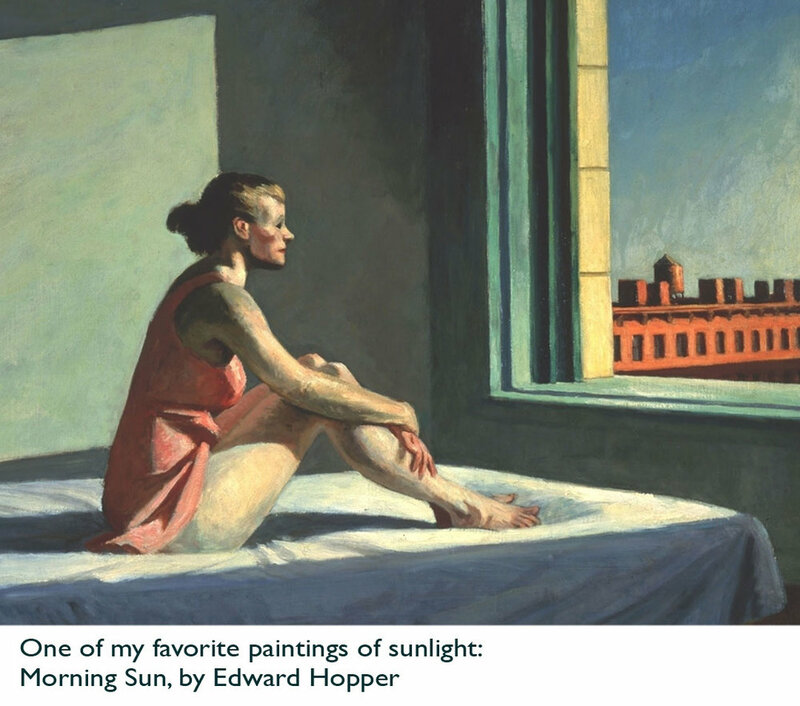 In the comic strip, the baby name Trixie makes friends with her sunbeam, and greets it with “Hello, sunbeam.” Visual artists from the Renaissance to Edward Hopper have been attracted to simple objects that have been transformed by light through a window. The quality of light – the warmth-color in the air itself, is a memory trigger. Looking at the sunlight across my worktable I remembered the feel of sun on my arms or neck, how it penetrates the skin with a tangible sense of well-being. Even now, long after I have given up my teenaged sunbathing habits with the common sense of adulthood, I love the feel of sun on my skin. And it did not last. Even from the time I first looked up from my sewing to the time I went to retrieve my camera- the light had changed. That, I think, is part of the appeal. Sunlight through a window is beautiful, and temporary. We have to pause to see it and feel it or it will be gone. And so it was time to resume the work of sewing. Gifted and warmed. NEWSLETTER: If you enjoy more detailed behind-the-scenes stories, as well as FIRST LOOKS at new works and members-only discounts, I hope you’ll become a Studio Insider.